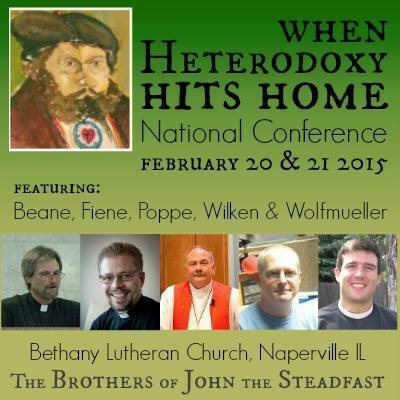 With great joy the Brothers of John the Steadfast announce our 2015 Conference, held once again at Bethany Lutheran Church in Naperville, IL. Many of the features that have made past conferences notable will again be there including the “no pietist’s allowed” gatherings on Friday night and also the Manly Man’s Breakfast on Saturday morning. Registration for the conference is now open; click here for information. Is it true one can buy five tickets for the price of two to this awesome event? May women attend? I ask that because of the ‘Manly Man’s Breakfast’ on Saturday morning. Diane. Absolutely, the breakfast has the name for traditions sake based upon its founding among the men’s group of Bethany. The conference is usually attended by all sorts of folks. Come and bring a friend. The excellent volunteers of Bethany. A couple of men from our congregation cook and they do the dishes! Cost and other conference details will be coming out later this week. Yes but will Horus, Donnell and Connell attend? Seriously, for those who cannot attend (like me), would there be some way to purchase a CD or mp3 download? This is about the only thing I can think of that would get me to leave Florida for Illinois in February. Oh, how I would like to attend. What a lineup. I can’t wait to attend. Is Pr. Wolfmueller going to do some more comedy for us this year? Will there be a break-out group on the topic, “When heterodoxy hits the fan”? Praying I can find a sitter for the older kids so the baby and I can attend…… the Army always manages to schedule drill for my husband in conflict with everything we want to do. Pastor Joshua Scheer :Diane. Absolutely, the breakfast has the name for traditions sake based upon its founding among the men’s group of Bethany. The conference is usually attended by all sorts of folks. Come and bring a friend. Instantly navigate the fatal failures of relevant audiences.